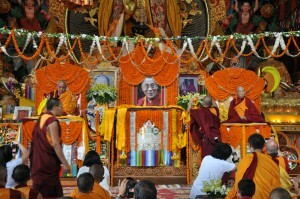 In July, Kopan Monastery held a long life puja for Lama Lhundrup to thank him for his years of kindness. Former director of Himalayan Meditation Buddhist Centre Tanya Pascual was there and gives the following report. The gompa was full of monks, nuns and lay people, listening to the chant master in his normal strong, full voice. Lama Zopa Rinpoche and Lama Lhundrup were both seated at the front. In between them was the throne for His Holiness the Dalai Lama. At first glance it looked like the normal large pujas that we have attended in the past. But today, despite the number of people and the chanting, there was a compassionate, quiet calm in the air. Sitting at the back of the gompa I noticed small acts of compassion in action. The younger monks, normally fidgeting, were attentive and focused, taking special care of their Dharma books; teenage monks were helping each other out by making sure no one got left without tea or offerings; strangers and friends were helping others whose legs were in plaster to walk to the altar to offer khatas (there were at least three of us! ); the long line of devoted students from Malaysia were holding up their precious offerings, waiting patiently for some time, as if each item was as light as a feather, to offer to the gurus. Of course some things were the same. The enthusiastic voices of the nuns exceeded those of the monks; the monks stepped deftly amongst those seated, busily participating in the normal rituals and tasks; a child’s delighted shout rang out amongst the chanting. So why was this puja different from the rest? We were all gathered together to say a heartfelt thank you to Lama Lhundrup for all the kindness, energy and compassion that he has dedicated to so many people that have passed through the gates of Kopan for so many years. Rinpoche led this thank you in his closing talk and it was a moment to really feel the selfless compassion of our gurus, to contemplate how fortunate we are to have these opportunities to practice, and to encourage us to take what we have learnt out of the gompa into the street and daily life.